The Obama Administration is working to award as much as $9.2 billion in government financing to clean energy companies before September 30. Congressional Republicans are opposed to giving government funds to solar energy companies after Solyndra LLC, a solar-panel maker, filed for bankruptcy after receiving $535 million in government loan guarantees. Two days later, the FBI raided its Fremont, California headquarters. Republicans have viewed Solyndra as a “poster child” for the anticipated failure of clean-energy subsidies awarded under President Obama. The stimulus program was passed in 2009 by Congress, which set a September 30 deadline for loan guarantees for most alternative energy projects. There are continued programs for investments in advanced technology vehicles and nuclear power plants. 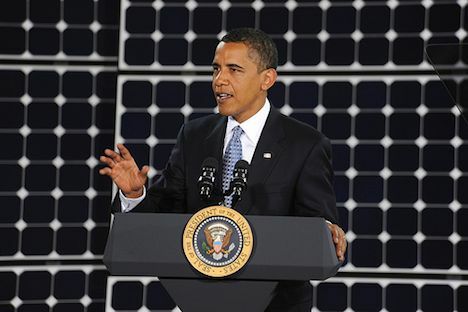 Image CC licensed by Nellis Air Force Base: Obama speaking about he importance of solar power in 2009. The GOP is opposed to just about everything. Because the GOP disliked their parties representatives and wanted change… Look what we get. God Help Us! Solyndra applied for their loan guarantee in 2006 under the program passed in 2005 by the Republican House and Republican Senate, and signed by Republican President George W. Bush. In 2008, that same Republican administration took the first 143 proposals, rejected 127 of them, and advanced the other 16 to final due diligence — including Solyndra. That same committee of DOE employees who under George W. Bush had advanced Solyndra’s proposal to final due diligence, decided in 2009 to approve the Solyndra loan. So this is a failure of the Republican Congress who passed the loan guarantee program, the Republican President and DOE who down-selected the Solyndra proposal, and those same DOE employees who gave the final approval. Solyndra is a Republican failure. In contrast, there have been no failures related to Obama stimulus loan guarantees. So this implies, as always, that if you want a government program to fail, give it to Republicans, they like making government fail. But if you want it to thrive, let Democrats run the government!